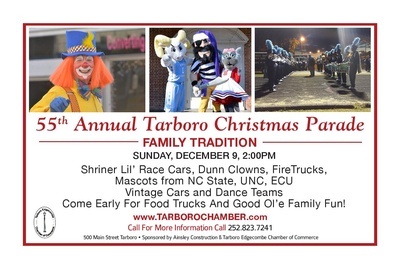 Everyone loves a parade so be sure to join us in Tarboro for more fun than ever for the 55th Annual Tarboro Christmas Parade! 90 entries will travel down the Main Street of Historic Downtown Tarboro delighting the crowd and making family memories. The lined street of onlookers can expect the Musick's Dance Arts Center with two great locations in Tarboro and Pinetops, North Carolina Princesses, the Shriner mini-race cars, community and corporate floats, The DUNN Clowns, our favorite local mascot Sparky, college mascots from UNC, NC State, ECU and this year we include Muddy from the Mudcats! Sing along to area marching bands like the Southwest Edgecombe High School Marching Band playing Christmas melodies, and the parade highlight… Santa Claus! The Parade kicks off is this Sunday, December 16th at 2:00pm. The Tarboro Christmas Parade is co-sponsored by Ainsley Construction and the Tarboro Edgecombe Chamber of Commerce. This is a free family event so come join the magic of the Season in Tarboro. Emcee John Moore, Sock Hop Show will be announcing from the grandstands on the Tarboro Town Common. Come early for Food Trucks. Street viewing along Main Street with grandstand on the TarboroTown Common. Inside location for viewing is the oldest brewery in Tarboro, TBC Brewery. Begins at the 200 block of Main Street and ends at the Tarboro Shopping Center/ Hope Lodge Street.